Yaya Toure says his maiden FA Cup final appearance will be tinged with sadness even if Manchester City win the trophy. The Ivorian, who will face Stoke City at Wembley on Saturday, left Barcelona for Manchester last year because he wanted to play alongside brother Kolo. But Kolo's failed drugs test means he is unable to play on Saturday. "Before I signed for City I told Kolo I wanted to come to England to play with him and win something together," said Yaya Toure. "That won't happen on Saturday, and that means it will be a hard moment for him, and for me as well." Kolo, 29, was indefinitely suspended in March after testing positive for a specified substance. The defender's suspension has galvanized the City players, who now aim to win the FA Cup for their absent colleague. "We have talked about the best way to win this cup, and he is supporting me and the team to win it," Yaya added. "He said if we win the cup we will be winning it for him as well." In two weeks' time, Toure's former Barca team-mates will also play at Wembley as they contest the Champions League final against Manchester United. It is a competition City will play in for the first time next season after securing fourth place by beating Tottenham on Tuesday. 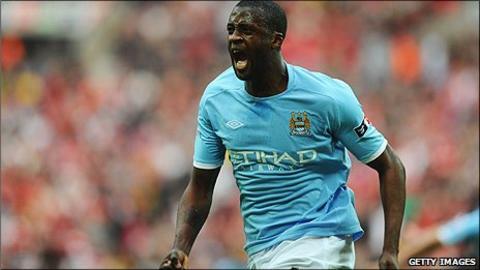 Toure insists City's achievements this season are justification for his big-money move to the Premier League. "If I had helped Arsenal or Chelsea or Manchester United to get to the Champions League, it would just be normal for them," Toure said. "But for City this is the first time and to do it after making a lot of signings who played their first year, it is not easy." It was Toure's goal against bitter rivals Manchester United that booked a place in the final for Roberto Mancini's side. "It was fantastic, amazing because you score a very important goal to beat your big rivals," he added. "United is the top club and to beat them in the semi-final is fantastic and now the dream can come true if we finish the job in the final." Manchester City are aiming for their first trophy in 35 years.